The soil beneath our feet is one of the least understood, least appreciated, most abused, but absolutely CRITICAL components of both a healthy environment AND a healthy ‘water cycle’! Water conservation & wise use, can save your wastewater treatment system from an early death! Check Out these helpful tips from EPA WaterSense! All across the United States, Canada and indeed the Earth – people rely on, and reap the benefits of, an often abused and grossly misunderstood critical component of life itself – dirt! Or to be more precise soil and the native supporting ecosystem, both above and below the ground, that keeps it and us healthy. We are talking millions if not billions of years in the making – to produce something that grows our food, filters our water, supports our homes and eventually receives us back into the cycle of life. The majority of homes and businesses in small town rural America rely on individual wastewater systems, which in turn rely on the soil to clean, disinfect and return water to the drinking water cycle. The billions of hard working bacteria out there don’t do well if you drown them! Want to understand how soil bacteria need oxygen to live and work? Click on the Image Above! PLUS too much water encourages roots, especially from non native plants, to take over and clog up the system! Are you interested in developing a water-smart landscape for your home or property? The WaterSense Water-Smart Landscapes guide(14 pp, 2.3 MB, About PDF) can get you started. Choosing the right plants, supporting soil health, and proper maintenance are all keys to water-smart landscapes. Consider the following suggestions to create a landscape that has curb appeal and is easy to maintain. If you’re designing a new landscape or rethinking your current one, the WaterSense Water Budget Tool can help you plan your landscape for water efficiency and tell you if you have designed a landscape that will use an appropriate amount of water for your climate. GardenForWater.com is for people just like you who want to know how to keep a healthy lawn and septic field. 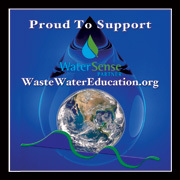 WasteWater Education 501(c)3 is a proud EPA WaterSense Partner since 2006.